Here's a hilarious site for all the parents who have bolted upright in a cold sweat at 1am, going "Cripies. I forgot the Elf on the Shelf!" And for all of you who have awoken to a child's sad voice saying, "Oh no. The elf didn't move. Maybe he's mad at me." All the elves on the shelves hitch a ride back to the north pole with the big guy tonight and parents will sleep soundly again. All of you who have been enslaved for the last 24 days, to that little red suited tyrant who moves by nite, this one's for you. 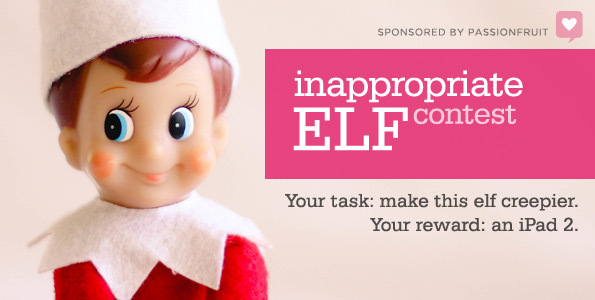 Over at Baby Rabies they're announcing winners tonight in The Inappropriate Elf On The Shelf Contest. Check it out! You'll be glad you did.